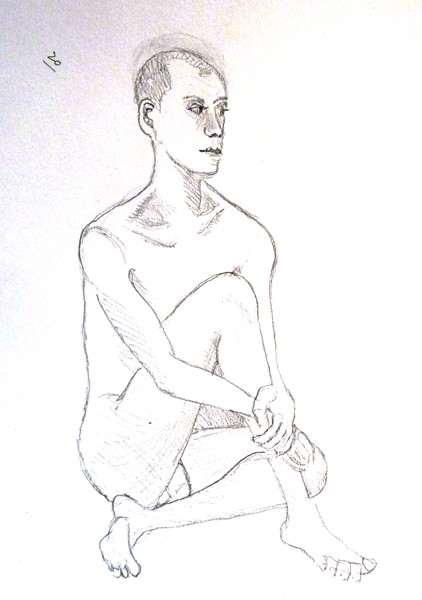 I haven't gone to a Figure Drawing Session since my FIT Course ended last semester. The Holidays were busy and then I started my Silk Dye Painting Class on the night I always went to the Society of Illustrators. So I was a little apprehensive about attending a new drop-in location on Friday afternoon, but my friend Judy paved the way. They have 3 models who rotate the different sets of poses. The first model did 20 one-minute poses. YIKES! These have never been fun for me - and she struck such bizarre poses that in the middle I just drew her head. If you look at the right of these heads you can see that she literally threw herself on the floor and lifted up onto her shoulders with her feet in the air! 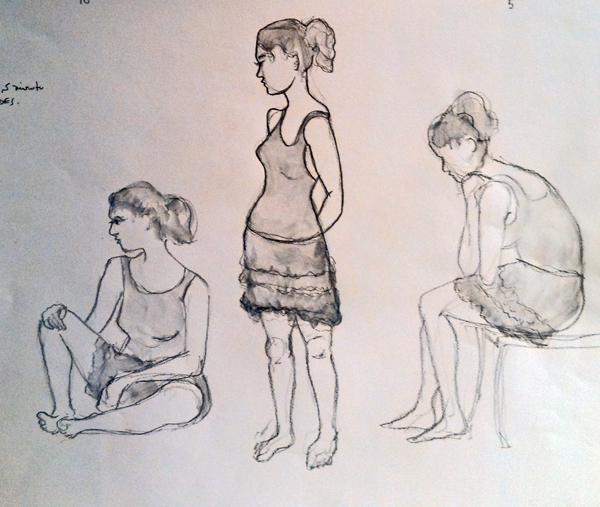 I already sketched the 2nd model 3 previous times - two at the Society of Illustrators and once in my FIT class. Familiarity, however doesn't necessarily make it easier. Here are 3 five minute poses of Blaine - and one 20 minute long pose. The 3rd model did some of the longer poses. 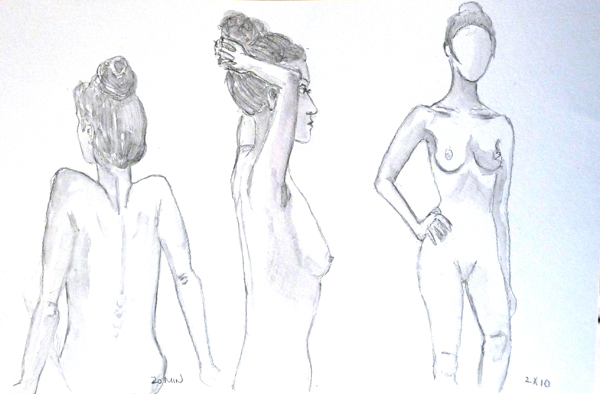 Here are 2 ten minute poses - and then one of approximately 15 minutes at the end of the session. 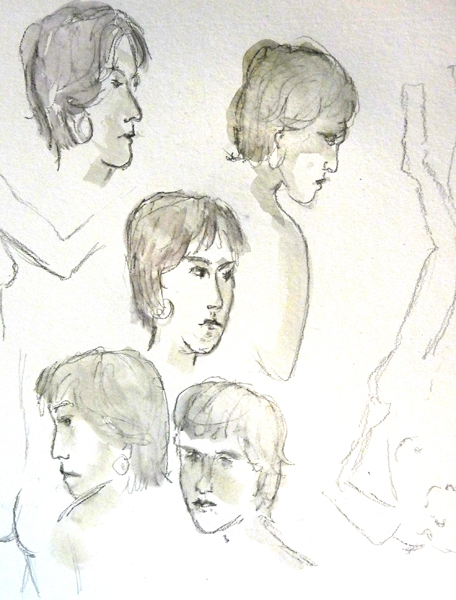 All drawings were done with a Derwent Sketch and Wash pencil - so I could add water if I wanted to after the session. There are on large paper and were photographed, not scanned. I decided to end my Studying Under the Masters Class after 8 weeks. It was WONDERFUL and I learned so much more about using my watercolors and my palette - much more because I learned it on my own through trial and error. The 9th apprentice and artist didn't interest me at all, so now I'm back to other projects. I needed another new watercolor sketchbook and finally had time to make it. 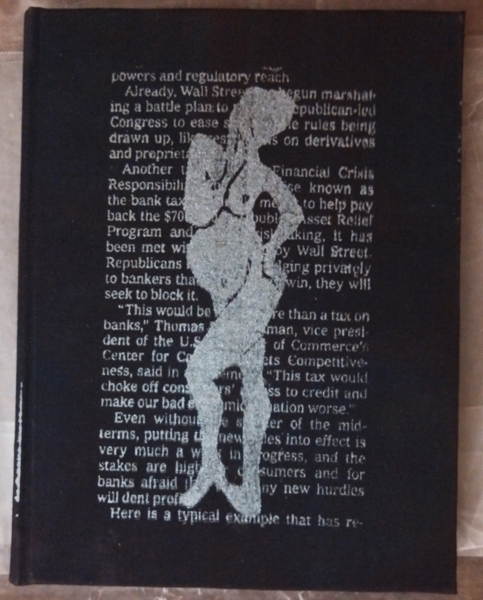 I overdyed a monoprint I didn't like and then added a screen print of one of my figure drawings that I made into a thermofax screen. This is a drawing of a pregnant model that I used before for other projects. This is a 48 page, 140 lb cased-in watercolor sketchbook, made using my standard method. I haven't talked much about my Fashion Institute of Technology (FIT) spring semester class. 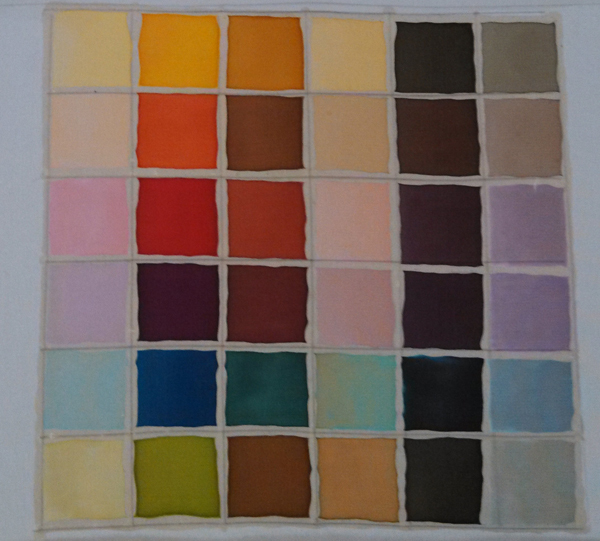 I am taking silk dye painting and we are learning many techniques on one 36 X 36 inch piece of silk. In our second class we mixed a full range of dye colors from our 3 primaries plus black and now we refer to it as a general guide for all of our subsequent painting. 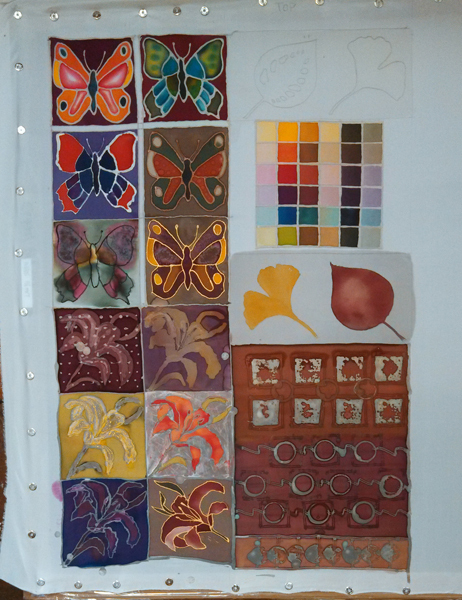 Here is the grid created with gutta and then "painted" with the dye colors we mixed. The second vertical row has our 3 primary and 3 secondary dye hues. Row one has tints of those (diluent added to lighten). Rows 3 and 4 are classic complementaries of the primaries and secondaries and their tints, and Rows 5 and 6 are their shades (black added to darken) and their tints. We've used many types of resists to make butterflies and flowers (gutta, wax and water soluble), and played with salt and alcohol effects. They are all on the left side of the silk. We are now working on "grounds" of wax or gutta/turpenoid and painting leaves. These are above and below the color grid - and this picture was taken before class this week before I finished my leaves. At the bottom is a textile design I made using Tjantings, stamps, and several layers of wax and dyes. The right side of the silk now has a self-portrait I "painted" on the top and will have a stamped textile design using thickened dyes on the bottom section to finish this piece next week. Then the dyes will be steamed and the wax removed. In two weeks we will start another project for the second half of the semester. Although I have experience with many of these techniques, I am still learning so much - and love being in a surface design studio for 4 hours each week! 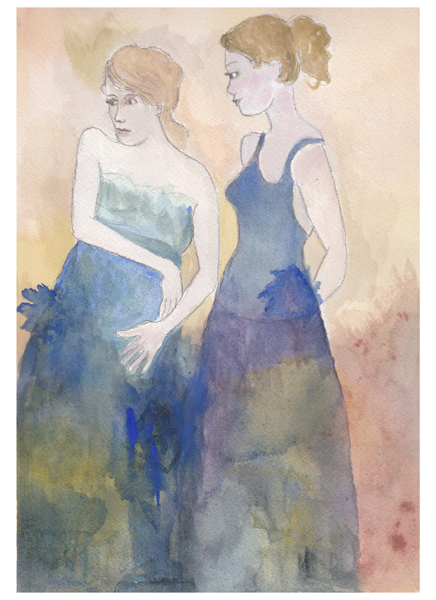 I am a self-taught watercolor artist I tried some watercolor painting in 2003-2005 with student grade pan watercolors. In 2005, I bought Winsor Newton artist grade watercolors in primary colors (warm and cool), and changed my very occasional painting habit into a quick daily sketch/painting in a 6 X 8" watercolor journal - at the same time that I partially retired. I follow some wonderful watercolor artists on their blogs, and try to learn from copying Masters. By transforming oil paintings into watercolor paintings for each of the 8 Masters in this Studying Under the Masters Course, I have learned so much that I realize that my learning style is definitely one of working things out on my own. For years I needed to increase the value range in my paintings and I knew it. And I desperately needed to learn how to paint deep shadows and bright sunlight. 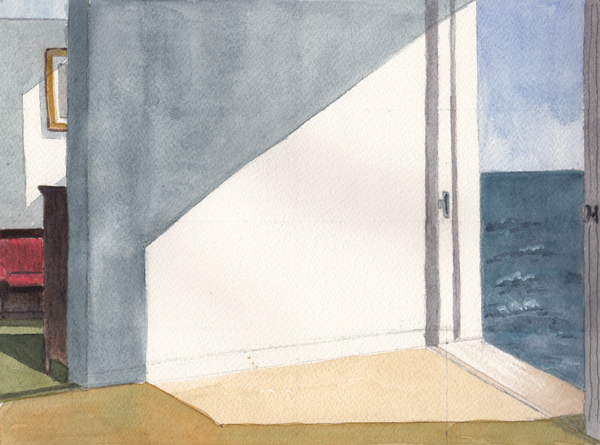 This week I specifically chose this Edward Hopper painting (Rooms By the Sea) to copy because it forced me to work out how to achieve that. Last night I asked Stephanie Lee - our apprentice for Hopper - whether she thought I should use the white paper, or white gouache for the bright light. She recommended that I start by leaving the paper white, and then adding gouache if needed. This is the painting with the pure white paper showing the areas of sunlight and I'm pleased. Hopper's shadows looked like they were even one shade darker than mine when the watercolor dried, I painted over one of my unerased grid marks on the floor - and it will be there forever - YIKES! I remembered to take some photos of "work in progress" and here are a few of them. They are taken with my cell phone camera - and the final painting, shown above was scanned. Then I built up layers of color using the same paint mixtures. 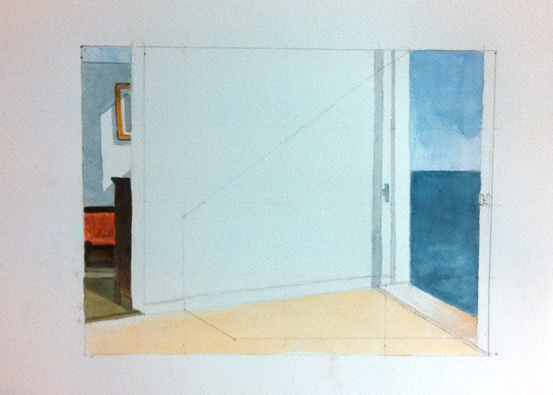 I tested the light and shadow in the far room, leaving the paper white, and making the shadow with Payne's Gray. The big shadows on the wall and floor in the Final Painting were painted with Payne's Gray (Wall) and Yellow Ochre + Payne's Gray (floor). Thanks Stephanie for choosing Edward Hopper as your Master. 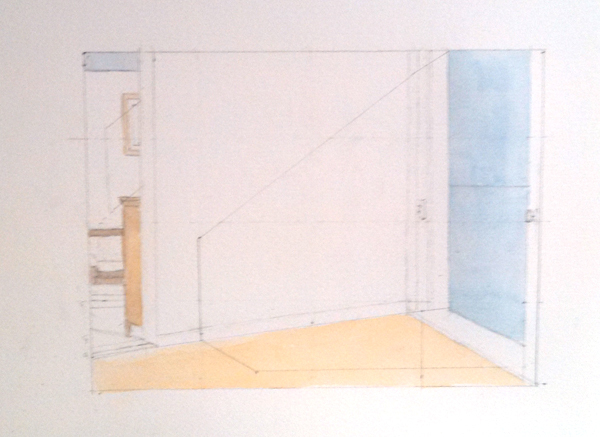 now I need to look at Reference Photos I've taken to work on a painting inspired by Hopper before Monday. I just painted my "inspired by Francoise De Felice" painting. For my composition I chose two of my figure drawings and transferred them to the Arches 10 X 14" 140 lb watercolor paper. The first drawing was from a 20 minute pose of a pregnant model from 2010 at Figure Drawing at the Society of Illustrators in New York City. I love this series of drawings and have even transferred some of them to Fabric. 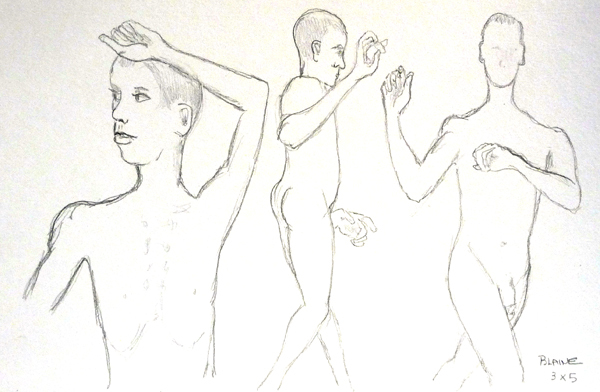 The second figure was from a 10 minute pose done in 2013 at the Battery Park Conservancy outdoor figure drawing session (the middle drawing). I transferred only the upper bodies of each figure. 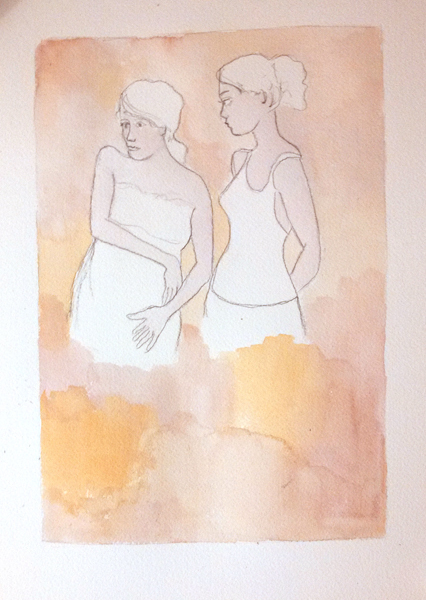 Then I added a watercolor underpainting for much of the surface using Winsor-Newton watercolors. After the first layer dried, I painted very loosely mixing alizarin crimson, French ultramarine blue, Winsor blue, Payne's gray, Van Dyke Brown, Yellow Ochre Pale, Quinacridone Gold, and Titanium White Gouache. Here is my finished painting - which I probably will still work on a little because I am still not happy with the skin tones. 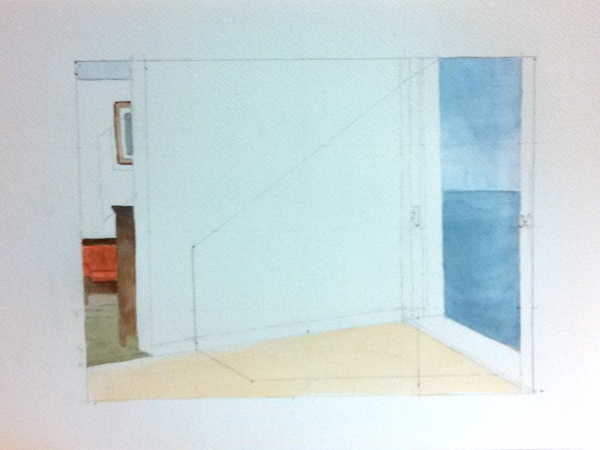 But it is time to move on to our week with apprentice Stephanie Lee and Master Artist Edward Hopper. 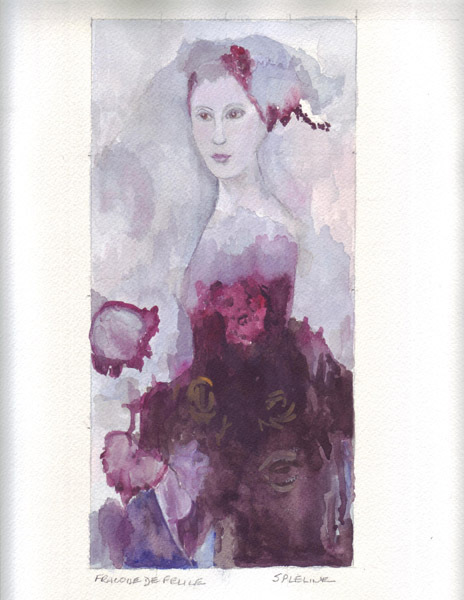 I selected a painting called Fleur de Poivoine to copy - one of the few watercolor paintings on her website. 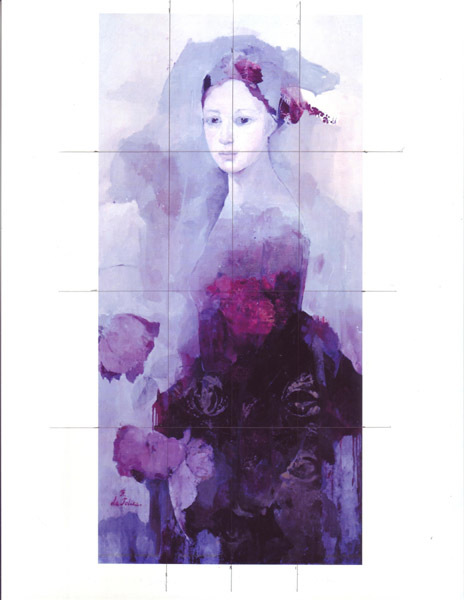 Here is the print with a grid that I drew over it, to transfer the drawing to my paper. I used Winsor-Newton watercolors and white Titanium gouache - on 10 X 14" Arches 140 lb cold press paper for my copy. My paper is much too big for my scanner, and since I never work this large, I haven't mastered the technique of scanning without shadows around the edges! Now I need to create an original composition using some of my figures drawings and techniques that I learned from copying her. Next Week we will study Edward Hopper - and I have lots that I can learn from him about bright lights and shadows!